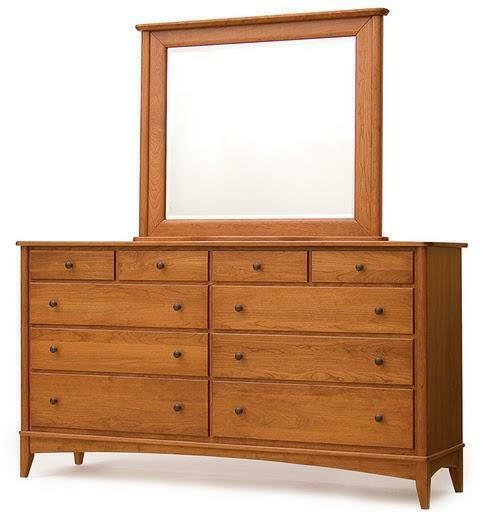 Our Amish Modern Triple Dresser offers plenty of storage space for your master bedroom. This Amish handcrafted Triple Dresser has classic lines that will bring contemporary style into any bedroom. Call today for questions or ordering assistance on our Amish bedroom furniture. The dresser drawers are dovetailed for years of everyday use. Choose from wood knobs, brass or black hardware to complete the look. All of our furniture is handcrafted by experienced woodworkers in Lancaster, PA. This hardwood dresser is handcrafted just for you and does take between 6 to 12 weeks to complete. This dresser can be customized! Custom furniture is one of our specialties at DutchCrafters!